Pain on the inside of the foot is usually gradual onset, caused by repetitive strain or overuse. A bunion is most common on the inside of the forefoot. Tibialis posterior tendinopathy is a common cause of pain on the inside rear foot or ankle. Stress fractures and nerve entrapments also cause inside foot pain. A bunion (also known as hallux valgus) is a painful swelling of the soft tissue with bone enlargement over the inside of the forefoot at the base of the big toe (MTP joint). Often the big toe will look as if it is bent in towards the other toes or even can lie across them in some cases. Pain is normally gradual and gets worse over time. Bunion pain is often relieved by removing your shoes off or wearing soft, comfortable, wide fitting shoes. Small growths of bone (called Bony exostosis) around the first MTP joint at the base of the big toe will form. Sometimes there is also inflammation of the bursa (small sack of fluid) which lubricates between tendon and bone on the inside of the foot. X rays will often be done to determine the extent of the deformity and whether there is any degeneration or arthritis of the MTP joint. Initial treatment for bunions is based on reducing pain and correcting any biomechanical problems of the foot. Later or in more severe cases, surgery will be required. Sports taping techniques or specific bunion braces can be worn to relieve pain and help correct the alignment of the joints. The abductor hallucis muscle lies along the inside of the foot and runs from the heel bone inserting onto the side of the big toe. A strain (tear) of the muscle can occur causing pain along the inside arch of the foot. The area will feel tender when pressing into the sole of the foot along the length of the muscle. 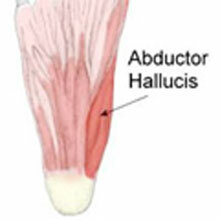 Many athletes with an abductor hallucis strain tend to overpronate where the foot rolls in too much, causing the foot to flatten during the gait cycle. Treatment involves rest and applying ice or cold therapy to reduce pain and inflammation. The foot can be taped to provide extra support whilst it is healing. It is important to identify any biomechanical dysfunction of the foot, such as overpronation and correct it. When pain allows a gradual return to full fitness with stretching exercises and massage may also be beneficial. Read more on Foot arch strains. The tibialis posterior tendon passes down from the muscle at the back of the leg, inside the ankle and under the foot. Overuse can cause injury or degeneration of the tendon causing pain on the inside of the ankle, which may also radiate along the length of the tendon under the arch of the foot. It is more common in older female athletes but has been known to affect younger ballet dancers. If there is significant pain under the foot, then this may indicate a partial avulsion where the tendon pulls away from the bone at the attachment to the bone. Treatment involves decreasing pain and inflammation through rest and ice/cold therapy, and when pain allows, a full rehabilitation program including mobility exercises, stretching exercises, strengthening exercises and functional (sports specific) exercises. Read more on Tibialis posterior tendinopathy. Medial calcaneal nerve entrapment, often called ‘Baxter’s nerve’ has similar symptoms to that of tarsal tunnel syndrome. A burning pain will radiate from the inside of the ankle, below the medial malleolus (bony bit on the inside of the ankle), under the heel and into the arch of the foot. Resting and icing the ankle are effective ways to help ease the pain and recover from this injury. The aim of treatment is to reduce pain and inflammation through rest and application of cold therapy followed by a rehabilitation program of exercises and a gradual return to full fitness. If conservative treatment fails, then a doctor may inject with a corticosteroid injection and failing that, surgery to decompress the nerve. Read more on Medial calcaneal nerve entrapment. A navicular stress fracture is a hairline fracture of the Navicular bone in the ankle caused by overuse and is one of the most common stress fractures affecting athletes. Symptoms include a poorly localized ache in the midfoot, which may radiate along the inside arch of the foot. Pain becomes worse with exercise, subsides quickly with rest, only to return again as training resumes. Tenderness may be felt when the thumb is pressed into the top of the foot over the navicular bone (called the N spot). Stress fractures do not always appear on X-rays until they have started to heal when the new bone growth can be seen. Treatment depends on how bad the stress fracture is, ranging from a walking splint to full six weeks immobilization in a cast, so it is important an accurate diagnosis is made. If the injury is mild it may be classed as a stress reaction rather than a stress fracture. Here the outer part of the bone has not actually fractured so weight-bearing rest in a walking splint may be recommended until symptoms have gone. If a stress fracture is diagnosed then complete non-weight-bearing in a full cast for a period of 6 weeks is essential. After 6 weeks the N spot over the top of the navicular bone is felt. If it is tender, then the cast is re-applied for a further 2 weeks non-weight-bearing. If there is a complete separation (fracture) of the navicular bone or the fracture fails to heal after a period of immobilization, then surgery may be required to fix the bone with a pin or screw.